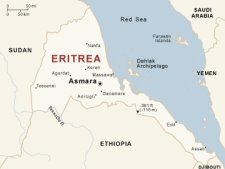 ASMARA, ERITREA (Worthy News)– Three Christians imprisoned for the testimony of Christ have died during the past months in Eritrea, including a 42-year-old man in solitary confinement Friday, according to a Christian support organization. Sources told Open Doors that Mehari Gebreneguse Asgedom died at the Mitire Military Confinement center from both torture and complications from diabetes; Asgedom belonged to the Church of the Living God in Mendefera. Also in Mitire, Mogos Hagos Kiflom, 37, reportedly died as a result of torture after refusing to recant his faith; a member of Rhema Church, Kiflom is survived by a wife and child. In October, Open Doors reported the death of Teklesenbet Gebreab Kiflom, 36, at the Wi’a Military Confinement center; he reportedly died after prison officers refused him medical attention for malaria. With these recent deaths, the confirmed number of Christians who died while imprisoned for their faith in Eritrea totals eight. At the same time, the government of President Isaias Afwerki has ramped-up its campaign against unregistered house churches, thereby earning Eritrea a slot on the U.S. State Department’s list of Countries of Concern as one the worst violators of religious freedom. Back in January, the Eritrean government arrested 15 members of the Kale-Hiwot Church in Keren; 49 leaders of unregistered churches in Asmara were also arrested during Advent, according to Open Doors. Last November, 34 members of the Kale-Hiwot Church in Dekemhare were arrested, including members of the Church of the Living God, Medhaniel Alem Revival Group and the Philadelphia, Kale-Hiwot, Rhema, Full Gospel and Salvation by Christ churches, according to Open Doors. Church leaders in Eritrea told Open Doors that nearly 3,000 Christians were imprisoned by last December. Eritrean officials disavow that any religious repression exists in their country, claiming they are only enforcing laws against unregistered churches, but their government has denied all attempts by independent churches to register; those caught worshipping outside the four recognized religious institutions, even in private homes, face arrest and torture. This entry was posted in Featured News, News and tagged Eritrea, News, Open Doors, Worthy News, Worthy News Correspondent by OCP. Bookmark the permalink.